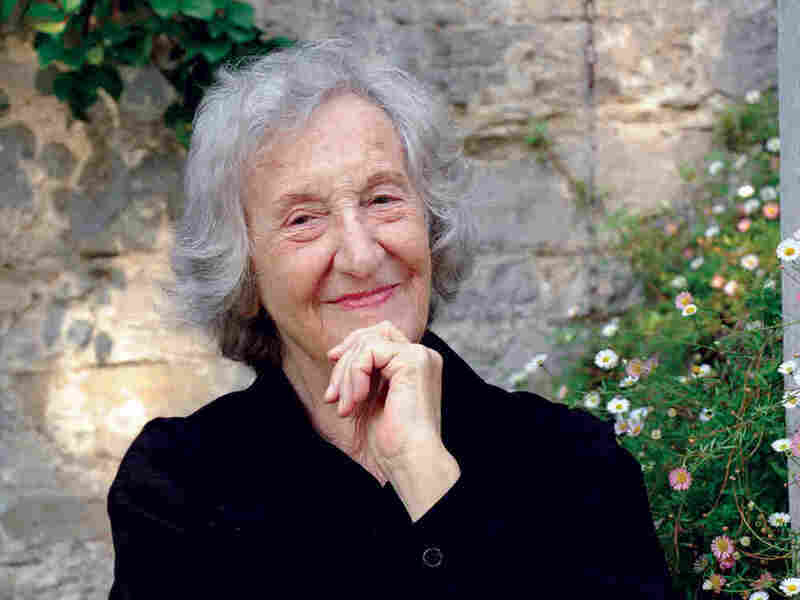 Thea Musgrave, The 90-Year-Old Composer With 80 Players In The Bullpen : Deceptive Cadence The Scottish-born musician, still busy writing music, celebrates her 90th birthday on May 27. Don't call Thea Musgrave a "woman composer." "When I'm composing, I'm a human being," she insists. "It's not a question of sexuality." Musgrave's music has been performed by many of the world's top orchestras, in Los Angeles, Chicago, Boston and London. Her operas have received premieres by the New York City Opera and the Edinburgh Festival. Musgrave was born in Scotland 90 years ago on May 27, 1928 and she's still composing. A concert on her birthday in New York will feature two world premieres. Musgrave, it turns out, didn't set out to be a composer at all. She wanted to study medicine. "I was going to discover the cures for all the diseases – you know, the arrogance of youth – cancer, [tuberculosis]. And it so happens in Edinburgh, the music school and the medical school are adjacent. And I found myself always going into the music school to see what was happening. In the end, I thought, you live once; you go where your passion is." Musgrave's passion for music led her to Paris in the 1950s, to study with the famous pedagogue Nadia Boulanger. Nine of her 22 classmates were women. "It didn't really occur to me that there was a problem, or anything else, until I came here and was confronted with, 'my god, you're a woman!'" It was 1970 when Musgrave became a guest professor at the University of California, Santa Barbara, arriving right after Vietnam War protesters had set fire to a bank. "It was a very unsettled and worrying and frightening period," She recalls. "But you know, when you meet people during those sorts of periods, you talk about real things much more quickly than perhaps you would in normal times. You get to know people for who they really are more quickly, I think. And that's when I met Peter." Conductor Peter Mark became her husband. "Thea's the kind of person that I knew from the first moment that I saw her, I wanted to know for the rest of my life," Mark says. When they met, Mark was an accomplished violist, and Musgrave wrote several pieces for him, including a concerto. "She's dramatic," Mark adds. "She thinks of music as a drama, whether it's abstract, even playing chamber music, she seems to understand there's a dialogue and she wants always to physicalize that." In the middle of Musgrave's Concerto for Orchestra, a clarinetist stands up and challenges the conductor. In Turbulent Landscapes, based on paintings by J.M.W. Turner, each movement has a different member of the orchestra rise to become a temporary soloist. And in Helios, her oboe concerto, the soloist plays the role of the Greek sun god, driving his fiery chariot across the sky, as other wind players form his steeds. Musgrave composed Helios for Nicholas Daniel, who says that at one point, while playing the oboe solo, he cues the winds to stand up, one by one. "What you get is the picture of Helios, which is me, with my horses of the chariot," Daniel explains. "And then you have the sun which is at the front of the chariot, which is played by the trumpet, soit's as if you see, as well as hear, the horses of the chariot." Musgrave's innate sense of drama naturally led her to compose opera. Mary, Queen of Scots, from 1977, is the work that made her famous. Her ability to combine various elements of music and drama prompts a sports metaphor from conductor Harold Rosenbaum. "It's like she has a baseball team with nine people on the field, but 80 people in the bullpen," Rosenbaum says. "And she starts throwing them on the field in different arrangements. So she has so many tricks up her sleeve, but all for the good of the music. Nothing is silly or just thrown in for the sake of doing it. It all makes sense." For Musgrave, 60-plus years as a composer whose work has been commissioned by orchestras and opera houses all over the world is the best response to anyone who brings up gender. "I fought the battle, I suppose, by trying to be as good at it as I possibly could," Musgrave says. "Because I felt that was the best way to prove a woman could be a composer." Thea Musgrave will cross the Atlantic five times this year, as ensembles on both sides of the ocean celebrate her 90th birthday by performing her music.